THE system of grading coal in India will change from January 1 so that it complies with the global standards. The switch, announced by the Union Ministry of Coal, will hit the power sector hard. Till now, the value of coal was calculated on the basis of its ash and moisture content. The best coal has the lowest ash and moisture content. This is called Useful Heating Value (UHV). The new calculation, called Gross Calorific Value (GCV), will also include the chemical composition of coal, says Kalyan Sen, former director of the Central Fuel Research Institute, who was a member of the team that had adopted UHV in the 1960s. The switch to GCV will set much higher standards for calculating the energy content of coal as it will take into account the content of highly combustible elements like carbon, hydrogen, oxygen, nitrogen and sulphur. “This will change coal pricing. Higher grades will fetch better prices and vice-versa,” says N C Shah, chairperson of Coal India Limited (CIL), a state-owned mining company, largest in the world. Even the lowest grade is placed in the bandwidth of 840 kcal, fetching a high price. The power sector, which consumes 75 per cent of domestic coal, has been making huge gains by purchasing coal graded under UHV. 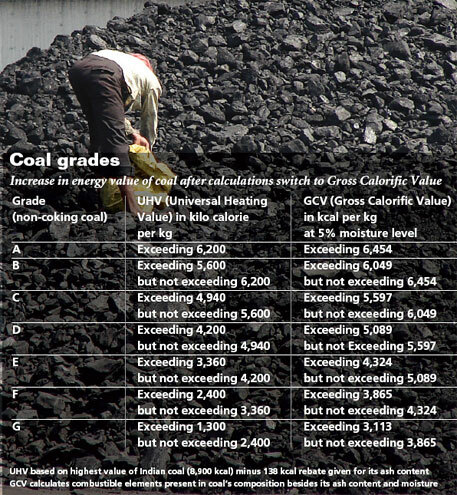 Indian coal has high ash content and most of it falls between Grade E and Grade G. Under the UHV structure, coal is graded into seven groups (see ‘Coal grades’). Government provided handsome rebates on high ash coal because it wanted power companies to purchase Indian coal. The boilers used to burn high ash coal consumed a lot of energy. “Modern pulverised boilers can burn high ash coal with almost 99 per cent efficiency. Therefore, the rebate needs to be reconsidered,” says Sen. CIL officials say calorific value, not ash content, should decide the pricing of coal. At present, the average price of coal is 30 to 60 per cent lower than the international price, says Shah. Sudden shift to the globally accepted GCV will severely hit the power sector. We are, therefore, adopting it in phases, he adds. The power sector argues that companies which depend solely on domestic coal will be hit hard. “With decreased mining, supply of coal is also dwindling. Increase in prices will make it difficult to maintain costs. The rebate should continue,” says a National Thermal Power Corporation official in New Delhi. India is the only major coal producer which does not follow GCV. Power sector has opposed the switch for years. The 1997 Ash Content Notification of the Ministry of Environment and Forests required use of coal with ash content not exceeding 34 per cent. This was to be adopted by June 2002. In August 2001, a parliamentary standing committee on energy recommended that quality of coal can be improved by standardising it. But each time, the power sector opposed it. To ensure availability of better quality coal through reduction of ash content, Pratik Prakashbapu Patil, Minister of State for Coal, recently announced setting up of 20 more washeries. At present, CIL operates 17 washeries—11 for coking coal and the rest for non-coking coal. Their combined annual washing capacity is 39.40 million tonnes. The ministry’s plan will increase the washing capacity by 111 million tonnes.